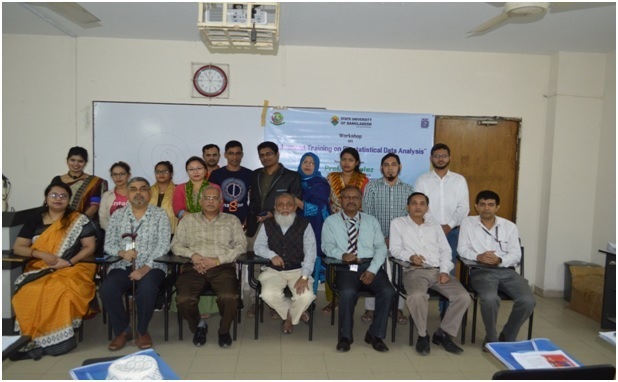 A Workshop on “Advanced Training on Bio-Statistical Data Analysis” was organized by the Department of Public Health (SUB) with the support of Institutional Quality Assurance Cell (IQAC) on 22nd November, 2018 at State University of Bangladesh .The resource person was Prof. M A Hafez who is the Head, Department of Biostatistics, Bangladesh University of Health Science (BUHS). The participants of this Workshop were from SUB (Existing students) and the faculty Members of SUB. Assoc. Prof and Head (Dept. of Environmental Science), Khan Ferdousour Rahman, PhD, Ms Nuhad Raisa Seoty (Public Health), and Dr. Sabbir Ahmed (Public Health). The honorable Vice-Chancellor, Prof. Dr. Md. Sayeed Salam, honorable Registrar, Prof. Maj. Gen. Mohammad Quamruzzaman (Retd. ), the honorable director of IQAC and the Professor and Head (Academic and Research Affairs, Department of Pharmacy) Prof.Md.Moklesur Rahman Sarker PhD, and Mr.Mamoon Al Rashid, Additional Director, IQAC was also present at the workshop. Prof Hafez discussed about the gaps on the Biostatistics syllabus, need assessment for MPH thesis, a few advanced techniques, criteria for choosing techniques of analysis and how to report statistics. He also emphasized on the Practical session using scientific calculator. The program was anchored by Dr. Jenifer Rahman, a student of Dept. of Public Health. The Ms Nuhad Raisa Seoty, Assistant Professor, Dept of Public Health gave the welcome speech and also thanked the honorable VC, honorable Registrar, and Director, Additional Director of IQAC for their whole-hearted support. Valuable speeches were also given by the honorable VC, honorable Registrar and Director, Additional Director of IQAC, resource person and Assoc. Prof. Khan Ferdousour Rahman. The workshop ended with vote of thanks by Ms Nuhad Raisa Seoty, who thanked the resource person and the participants and concluded the session.